Basseterre, St. Kitts – During the 2018 budget debates Dec. 11, the Honourable Eugene Hamilton, minister of agriculture, expressed that the agricultural sector has seen significant improvements for 2017. 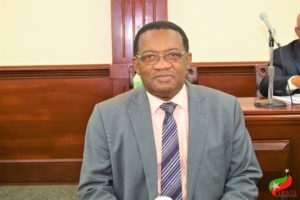 “The output in the agricultural sector, despite its challenges, saw significant improvements this year,” he said, while noting that there have been increases in the marine sector, food production and the crop sub-sectors. Minister Hamilton stated that while there were some challenges in the agricultural sector, the production of food grew from 799.05 metric tons to 978.88 metric tons, showing an increase of 22.5 percent during the past year. He also noted that there have been significant increases in the cultivation of onions, pineapples and watermelons. He said that onions have seen an increase in production by 48.2 percent and pineapples of more than 200 percent. The minister outlined that the ministry will be focusing on crop and livestock losses and the effects that climate change will have on the agricultural sector with the expectation of becoming more sustainable and food secure in the federation. He also appealed to the hotels and local businesses to support the mission of increasing local consumption and assured the public that the local food being consumed is of a high quality. “I am encouraging you to buy locally, which we are producing here of the highest quality, rather than to hang on to importing food into the federation,” he said. Minister Hamilton lauded the Inter-American Institute of Cooperation on Agriculture and other local personnel for the formation of the online agricultural market at www.agrofresh.kn/ that links local farmers to buyers locally and regionally. He explained that the online portal allows farmers to expand their business and have a marketplace to build an online store to advertise their products. “I am pleased that every farmer in the country can go online and build a store and have his or her own business online and be able to market any product that he/she produces,” said Minister Hamilton.